I just finished reading one of the most profound and important books that I have read in recent years. 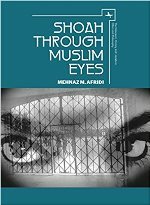 Professor Mehnaz Afridi, an American Muslim woman of Pakistani origin, has written an academic and at the same time very personal book entitled SHOAH THROUGH MUSLIM EYES, which is as inspirational as it is informative. Professor Afridi directs the Holocaust, Genocide and Interfaith Education Center at Manhattan College, a Catholic College in the Bronx, in New York City. Yes, you read it correctly—an American Muslim woman specializes in teaching about the Holocaust at a Christian College in the most Jewish city in America. It is a very unusual combination, indeed. This book and my scholarly interest in Jews, the Shoah (Holocaust) and Judaism were sparked by my desire to understand the ‘other’. I decided to write this book as I began to interview survivors because I wanted not only to tell their stories [which she does in great detail in chapter 4 which she calls “The Document”], but to join their stories with my experiences of anti-Semitism today. As Muslims, we are taught to accept justice, truth and equality…. Contrary to the public perception in the contemporary world, the message of Islam has always been a universal one to me—encouraging tolerance, egalitarianism, and acceptance of other faiths and cultures. Her understanding of Islam comes not only from her research and scholarship, but from having grown up in an open, pluralistic home and community. Throughout the book, she shares this message, based on poignant personal stories as well as her own professional reading and reflection. How can one deny the genocide and silent screams of so many lives lost during the Shoah? Do political differences make us inclined to separate ourselves from others to the point of denial and repression of one another’s suffering? The denial of the Shoah is a crime against humanity. What is it about human beings that become undeniably repulsive when they deny the deaths of millions, knowingly avoid the evidence, and remain painfully silent? The silence that I refer to is the tacit silence and casual acknowledgements with Muslim communities and countries that the Shoah is a subject that is not discussed, and if discussed must be seen as relative to other discussions of suffering. As Afridi points out towards the end of the book, she is part of a small group of Muslim scholars who are writing about the Shoah. This indeed is a very encouraging and inspiring phenomenon. Will Muslims read this book? I don’t know, but I hope so. I hope that modern Muslims—certainly those who are in academia and in public life as religious leaders and educators— will read it and be informed and inspired by it. I was fatigued by antisemitism and Islamophobia in the world, and I thought that the book might offer hope to Muslims, a different perspective. I do not know if the book will have great impact, but it might help to create a dialogue about the pain and suffering of ‘the other’. This book had a great impact on me. Not only did I learn a great deal about an important subject—the importance of remembering the Shoah and other genocides, with all their differences—but I also learned that the Shoah has to be understood in its uniqueness and at the same time with implications for all other genocides in the past and in our current era. I hope that this book will have a great impact on many people. It should certainly be read by everyone who studies the Shoah and other genocides, and by everyone engaged in interreligious understanding and cooperation in today’s world. Its deeply interreligious message concerning the need for greater understanding of the pain and suffering of the other is of paramount importance in our world where there is far too much ignorance, apathy, disinformation and misunderstanding, which leads to more and more hatred and violence. This is a book for Jews as well as Muslims. I hope that many religious leaders, educators and activists in both religious communities, and in many academic communities in many places in the world will use it in educating about the other in new and inspiring ways that can make a difference in Jewish-Muslim relations in America, Israel and in many other places in our troubled world. First published in Huffington Post, 08.01.2018. Re-published with kind permission by the author. More about the author, please see: Rabbi Ron Kronish.